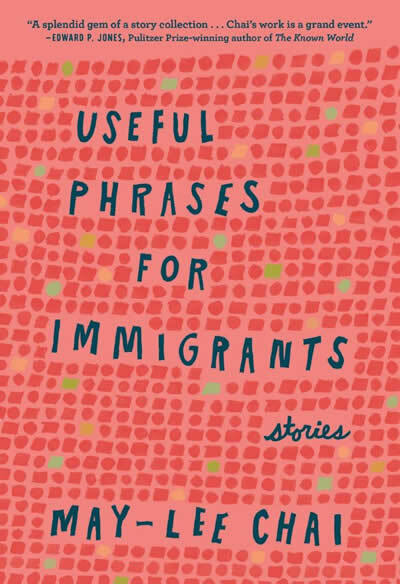 May-lee Chai's next book, Useful Phrases for Immigrants: Stories, is coming out this October, 2018, from Blair. She is the recipient of the Bakwin Award for Writing by a Woman, an NEA fellowship in prose, and an Asian/Pacific American Award for Literature, among other honors. Find her at May-lee Chai and on Twitter. For American authors writing about a multicultural, globalized world, the issue of translation is unavoidable: what to put into English, what to leave in a mother tongue, and how to render the mixed-English that often is used in immigrant families. Writing in English, I often write about Chinese immigrants and Chinese American characters who are navigating between not only two cultures but also two languages. One of the things I want to avoid is exoticizing my characters. I remember with horror a short story that I was forced to read in elementary school about a Japanese American girl who was embarrassed by her Japanese immigrant mother. In the story, the mother character's lines of dialogue were rendered into hackneyed "broken English," which was supposed to be funny. I wanted to sink into the earth when my class read this story aloud. The plot of the story—the narrator learning to appreciate her mother despite her "flaws"—was offensive. Worst of all, it was the only story in all my five years of elementary school that even had an Asian character in it. I remember being afraid that my classmates would think that my family and I were like the characters in that story, which was flat and certainly did not celebrate immigrants' ability to code-switch. My father is an immigrant from China as were my beloved paternal grandparents. Every weekend we drove from our house in the suburbs in New Jersey to New York City to have Sunday dinner with my grandparents in their favorite Chinese restaurant. My brother and I looked forward to these dinners when we would sit around the large round table, delicacies spinning by on the Lazy Susan, my grandparents and father and uncles shouting merrily at each other in Mandarin. One of the reasons I became a writer was to correct this literary injustice that showed an Asian American family as being an anomaly and embarrassment. I wanted to write stories that showed the complexity of my Asian American identity, which included pride in my Chinese cultural heritage. From a craft perspective a recurring issue is how best to reflect the many kinds of language that are spoken in immigrant families. Simply rendering all speech into perfect, fluent, American English doesn't always feel accurate. Many immigrant families use a mix of languages, and I find the mixing of English with Mandarin to be a natural fit, reflective of how people I know actually speak. "Where are we going? I can program it into my GPS,"" I said. "She can tell you the directions,"" the General said in his careful English. Saina found her father looking at the titles on her bookshelf. "Ni yao bu yao xian shuei yi ge jiao?" she asked. An intrepid reader could always type the lines into Google translate if she really wanted to know exactly what they are saying, but given the context, an exact translation is not necessary to understand the caring relationship between father and daughter. The untranslated dialogue is not here to exoticize the characters but helps deepen the characterization. While Charles has been shown speaking in English to his younger college-aged kids, the fact that the father feels comfortable speaking in Chinese to his eldest daughter suggests a closeness as well as the passage of time. When he and his wife first had this child, they were younger, newer immigrants in America. English was less familiar to them, so they spoke to their child in Mandarin. By the time the younger kids are born years later, they are more integrated into American society, more comfortable in their English, and in fact English has become the primary language of the family. Similarly, I'm impressed with the elegant, poetic way author Luis Alberto Urrea has integrated not only English and Spanish into his writing but also how he has made commentary about language integral to so many of his works. For example, Urrea addresses directly the hybridity of American English in Nobody's Son (University of Arizona Press, 2002): "English! It's made up of all these untidy words, man. Have you noticed? Thanks to a new generation of writers, American English's hybrid form is now celebrated in immigrant stories rather than mocked or mined merely for laughs.